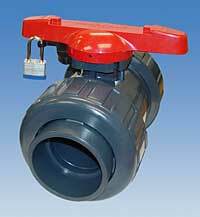 The locking handle for Asahi’s Type 21 Ball Valves is a padlock-able handle that directly replaces the standard valve handle and acts as a deterrent to prevent unauthorized cycling. The new design allows the handle to serve as a position indicator, demonstrating the current state of the valve. The handle also doubles as a carrier removal tool, used for valve maintenance and adjustments. Available for a variety of valve sizes, the handles are sold in kit form and permits easy field installation.